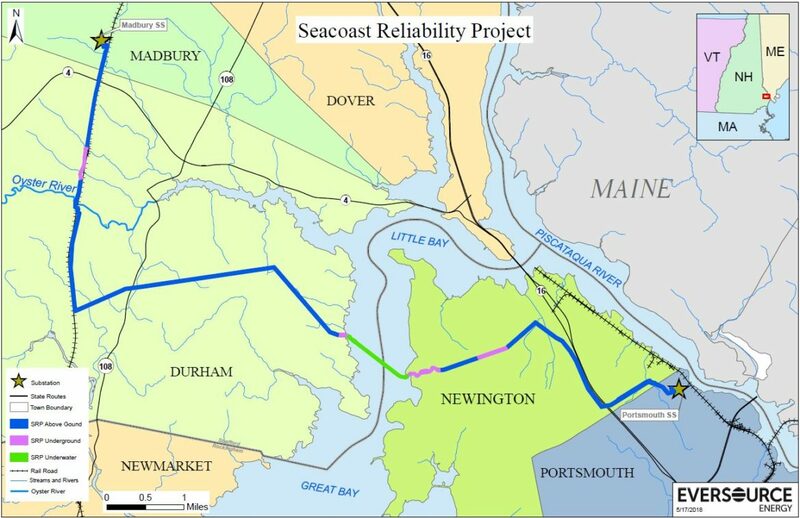 MANCHESTER – Eversource says its study comparing potential methods for the Seacoast Reliability Project transmission line to cross Little Bay confirmed that burying it in the bay’s bottom sediment will be best. The “jet plow” method will have “minimal impact on the environment, the least disruption on area residents and properties, the lowest cost, the shortest schedule and is the most appropriate method,” according to a news release issued Monday by Eversource. The New Hampshire Site Evaluation Committee required Eversource to conduct the detailed review, filed July 1 with the SEC, comparing the feasibility of the proposed “jet plow” burial method to that of “Horizontal Directional Drilling.” HDD would place the project’s power cable deep beneath the bay by means of a significant drilling operation, the release said. Favoring the jet plow method, Eversource New Hampshire President Bill Quinlan said it’s important to pick the best crossing method for the 13-mile, 115 kV reliability project from Madbury to Portsmouth. “Based on the results of this comprehensive study, we’re confident that the Site Evaluation Committee members will have a better understanding of why the jet plow method is appropriate for this project and why we recommend its use,” Quinlan said. Also on Monday, Counsel for the Public Chris Aslin filed supplemental testimony of Payson R. Whitney, III, P.E., ESS Group. And Durham Town Manager Todd Selig said he would wait to read the voluminous new information before commenting. Durham is an intervenor in the SEC docket, along with the University of New Hampshire and other interested parties. Eversource says the project is needed because demand for electricity in the Seacoast area is growing at twice the rate as the rest of New Hampshire. The project would include substation upgrades and the line would connect two existing substations in Madbury and Portsmouth. According to Eversource’s website, the proposed line would pass through Madbury, Durham, Newington and Portsmouth along existing utility corridors. “This 13-mile project will improve the transmission system in the New Hampshire Seacoast area so customers will have reliable electric power to meet their growing energy needs, in keeping with national and regional reliability standards,” Eversource said. According to Monday’s news release, using HDD technology would result in more than two years of extensive construction activity on either side of Great Bay, require the acquisition of additional easement rights on more than 10 properties in Durham and Newington, and more than double the cost of the project compared to the proposed jet plow burial crossing. Using the jet plow method would mean the total project would cost $84 million while the HDD method would mean the cost would be $216 million and take 28 months while jet plow construction would take only three months, according to the Eversource study. “The jet plow method would place the power cables under several feet of the bay sediment by means of pressurized water jets, temporarily suspending some sediment in the water column,” Eversource stated. The state Department of Environmental Services in February recommended, with certain conditions, approval of the cable installation using jet plow methodology, but also recommended that the SEC require the feasibility study, including both the jet plow and HDD methods, the release said. • The Intervenors shall file Supplemental Pre-Filed Testimony on or before July 20. • Counsel for the Public shall file Supplemental Pre-Filed Testimony, excluding Supplemental Testimony Pertaining to HDD, on or before July 20.
at 9:00 a.m., at the Public Utilities Commission, 21 South Fruit Street, Concord. • The final adjudicative hearings will take place in August and September. • Counsel for the Public and Intervenors shall file Final Briefs within 14 days of the close of the record. • The Applicant shall file its Final Brief within 21 days of the close of the record. and a notice scheduling the deliberations will be issued.